Hello Katie Girl: Anchors Aweigh! Today I am wearing the Dizzy Anchors dress from J. Crew. The anchor pattern on this dress will truly make you dizzy with delight! This dress is currently on sale at J. Crew, plus the extra 40% off promotion running at the moment. In my opinion this is the perfect light, fun dress for summer. I have bought several anchor related items from J. Crew in the last month or so including the anchors aweigh blouse and sequin anchor tank. I also tried to buy William an anchor doggy bed, but my husband said since we don't live by the beach it would look odd in our house. He also said William would just rip it up, which is probably true! I guess I just can't resist anchors. 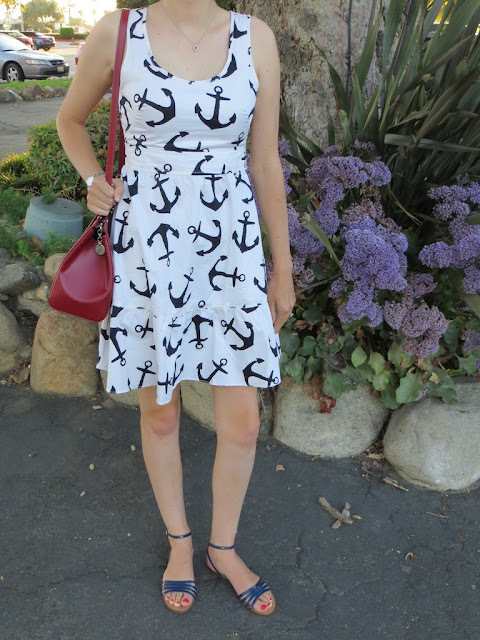 Anchors and nautical themed things are definitely a trend which I have latched onto for summer! My bag is the Louis Vuitton Epi Brea in Rubis. The Rubis color was retired last year. It has since been replaced with the slightly brighter Carmine color, which is also gorgeous. Nothing beats a classic red bag! Ohhhhh you got the sequin anchor top? Jealous! Love this on you! Thanks so much Laura! The sequin top was actually on sale, plus 30% off at my local J. Crew store a few weeks ago. I don't understand why it isn't on sale online yet. J. Crew is so weird about their pricing online vs. in their brick and mortar stores.